Do you wish summer would never end? Whether you’re enjoying your first summer in Colorado or you’ve weathered the seasons for a long time, it’s agreed that our state’s 300+ days of sunshine per year can’t be beat. However, when change of season occurs and the weather turns cold, you can do more than just dream about al fresco meals on the patio. Bring those warm summer days into your kitchen design and enjoy a sunny ambiance all year long. How do you bring the outside in? First, we recommend choosing hues and accent colors that evoke summer nostalgia. Install custom cabinets or semi-custom cabinets that are painted in colors that mimic the sun, the ocean, the beach. A good example is this soothing Islander blue by Medallion Cabinetry. 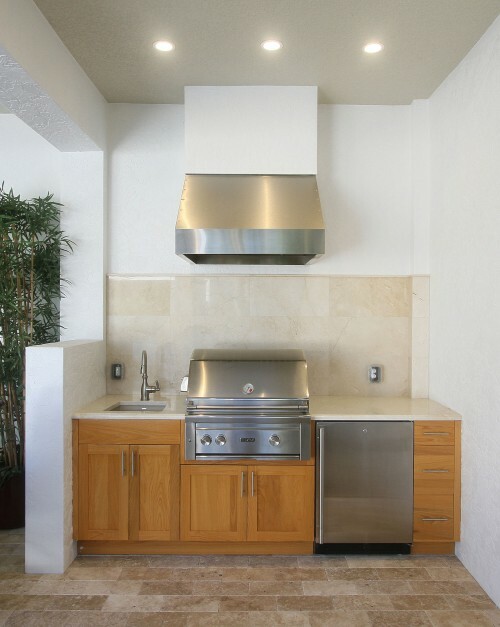 Secondly, place accessories throughout your kitchen that have warm, summertime themes. These could be in the form of curtains, decorative tile, colorful knick-knacks or fun lighting fixtures (perhaps with bamboo shades!) Natural light will always help accentuate the sunny palette in your design. Therefore, consider adding skylights, large windows or glass doors to welcome in the sunlight. Create an extended kitchen space that builds continuity between the inside and the outside of your home. All-weather cabinets are perfect for patios, porches and poolside. Quest Outdoors by Crystal Cabinets is constructed from extremely durable, moisture resistant, 100% recycled polyethylene. A run of exterior cabinets on your patio or deck becomes a continuation of your kitchen. Certainly, it’s convenient for family gatherings and entertaining friends.Additionally, it welcomes you to use the grill even in cold temperatures. Natural materials, such as Travertine flooring and recycled glass countertops, are great additions to imbue summertime in your outdoor space. Having an additional doorway from the kitchen to the patio or deck is a great option on warm days. You can carry food in and out with ease and improve the flow of foot-traffic through the room. As stated earlier, this type of doorway can provide a great source of natural light. Make your kitchen appear larger and provide visual connection to the outside world with an over-sized glass door, such as sliding or floor-to-ceiling French design. As you enjoy these summer days and warm evenings, make note of what elements of the season you can add to your Denver kitchen renovation. Bring a pleasant, inviting atmosphere to your home year-round. Contact us and we’ll help you create an endless summer in your home!